These are our generic terms and conditions. Some properties have specific and unique conditions. Guests receive specific rental agreements for each properties they reserve. You understand that you are renting our home and we work hard to keep it very nice and clean. You agree to take very good care of our home and treat it as you would your own. You understand that while Destin is a resort area, there are permanent residents living in the same neighborhood with kids who go to school and parents who have to go to work in the morning. You agree to keep noise to a minimum - no loud or late night parties. No bachelor parties. No throwing things into the yard or pool, or the neighbor's yards. You agree to read the info book upon arrival which contains information the City of Destin requires we share with our guests that basically echoes the same as above. 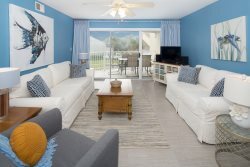 We are a family-oriented rental and Destin is a family-oriented destination. If these expectations are not something you can agree to, then this rental is not for you. Reservations must be made by an adult over the age of 25. We do not rent to vacationing students - this is a family Oriented rental. Reservations made under false pretense will be subject to eviction and forfeit of entire rental payment, damage deposit, cleaning fee and taxes. Reservations may not be transferred, sub-leased, sublet, or sub-contracted to another party, nor may third party reservations be made. Reservations are Weekly Only . Due to insurance issues in Florida, we can only make weekly bookings. Of course we can't stop you from leaving early, but all bookings are for weekly 7 night blocks. A down payment is required at the time of booking to hold your dates and will be credited toward your final balance. The remaining balance plus any security deposit is due no later than 60 days prior to arrival. For bookings made less than 60 days prior to arrival, payment in full is due at time of booking. All payments are to be made by credit card through our web site or directly with us on the telephone. We may also agree to accept a personal check by mail. If your payments are not received by the specified dates, you risk losing your reservation and deposit money. Security deposits, if applied, vary per reservation, and will be stated in the cost breakdown. Following check-out, we will complete a walk through and inventory check of all items. If everything is in the same condition that it was upon your check-in and all household items are accounted for, your security deposit will be refunded to you within 30 days of check-out. If damages exceed the amount held, the acceptor of this agreement is responsible for paying all fees incurred by such damage. This Vacation Rental Damage plan covers unintentional damages to the rental unit interior that occur during your stay, provided they are disclosed to management prior to check-out. The policy will pay a maximum benefit of $3,000. Any damages that exceed $3,000 will be charged to the credit card on file. If, during your stay at one of our Rental Properties, an Insured Person causes any damage to real or personal property of the unit as a result of inadvertent acts or omissions, the Insurer will reimburse the Insured for the cost of repair or actual cash value of such property up to a maximum benefit of $3,000. Certain terms and conditions apply. Full details of the Vacation Rental Damage coverage are contained in the Description of Coverage or Insurance Policy (www.vacationrentalinsurance.com/G10VRD). The Vacation Rental Damage can be purchased up to, and including at, check-in. By submitting payment for this plan, you authorize and request CSA Travel Protection and Insurance Services to pay directly Sugar Palm Rentals, Inc. any amount payable under the terms and conditions of the Vacation Rental Damage. Please contact Sugar Palm Rentals, Inc. directly if you do not wish to participate in this plan or assignment. Taxes are subject to change. If the county or state raises taxes, you will have to pay the additional amount before check-in. If they lower taxes, we will refund the difference with your security deposit after your stay. Taxes are generally based on the date you check-in, not when you make your reservation. Absolutely No Smoking is allowed in any of our homes or cottages. Your entire security deposit will be forfeited and you will be charged additional for carpet cleaning if evidence of smoking is found. here are to be NO illegal drugs taken into or used inside any of our homes. If any evidence is found, you will forfeit your ENTIRE security deposit, and we will notify the police for our own protection. The liability and damages that could occur should subsequent guests find this are potentially too great to overlook. If you cannot agree to these conditions, then this rental is not for you. You are responsible for the actions of everyone in your party. If we have made an exception for you to bring your small or medium size dog, your pet is to be kept on a leash when not in the fenced back yard and must be up to date on all shots and flea & tick medicine prior to arrival. You agree to keep your pet in a kennel when no one is home. You also agree to clean up the yard prior to departure. Any damage caused by your pet will be taken out of your security deposit. If the amount should exceed the amount held in security, you agree to pay the additional fees to repair or replace any damaged items. The maximum occupancy for this home is listed above. Check-In Time is 4:00 p.m. Central Time. Due to the length of time required to get our homes ready for you, we cannot accommodate early check-ins. Check-Out Time is no later than 10:00 a.m. Central Time. We ask you to be respectful of this policy as we have limited time to prepare our homes for the next guests. Housekeeping/Linen Service is provided following check out from 10:00 AM to 4:00 PM Central Time. All monies paid are non-refundable. There are no refunds for cancelations, early check-out or reservation changes that result in a shortened stay. We recognize that unforeseen events do occur, which is why we highly recommend Travel Insurance which can be added to your reservation if booked through us. You can find more information about trip insurance on this website or by calling us. If there are issues with items such as air conditioning or other appliances, televisions and cable service, swimming pools, and other things, we will do everything possible to get it fixed and working quickly. You agree to allow reasonable access inside and outside the house. No refunds other than for pool heating will be made for inoperative appliances as we are going to do our best to address these issues. Upon arrival, please take note of our house information book which will give you instructions on garbage removal, pool alarms, etc. This also contains important safety information as well as emergency contact numbers and city ordinances we may be required to share with our guests. Parking is strictly limited to the driveway and garage if present. Do not park on our grass. Parking on the street or over the sidewalk is not allowed in Destin. Many of our properties include a swimming pool. There is no lifeguard and no diving is allowed. By renting a home with a pool, you are taking full responsibility for the safety of all guests and recognize that use of the pool is “at your own risk.” Our pools are professionally maintained and if you have any problems with them we will send the company out to address them. To help us keep our costs down and help protect the environment, you agree to keep the air conditioning set no lower than 72 degrees F during your stay in the spring or summer. You agree to keep all doors and windows closed at all times as leaving them open causes mold around the air conditioning registers in the home and wastes electricity. Trash is picked up on Tuesday and Thursday morning by Waste Management (unless otherwise advised or noted in the house.) You agree to put the trash bin out the night before and pull it back after it’s been picked up. If the trash bin is overflowing on Saturday, we must have it privately picked-up before the next guest arrives and will deduct $75 from your security deposit to cover this expense. Hold Harmless Clause By accepting this reservation, it is agreed that all guests are expressly assuming the risk of any harm arising from their use of the premises or others whom they invite to use the premises. This agreement is made upon the express condition that Sugar Palm Rentals, Inc. and its employees and agents shall be free from all liabilities and claims for damages and/or suits for or by reason of any injury, or death to any person or property of you and your guests, agents, employees, or third parties, from any cause or causes whatsoever while in or upon the premises or any part thereof during the term of this agreement or occasioned by any occupancy or use of said premises or any activity carried on by you and your guests, agents, employees, or third parties. Therefore, in connection herewith, you and your guests, agents, employees, or third parties hereby agree to indemnify, defend, save, and hold harmless Sugar Palm Rentals, Inc., its agents and employees from all liabilities, charges, expenses and costs on account of or by reason of any such injuries, deaths, liabilities, claims, suits, attorney's fees or losses however occurring or damages growing out of the same.